Ittefaq Electric Store deals in all electric spares and provides general maintenance services for all kind of household devices and equipment. 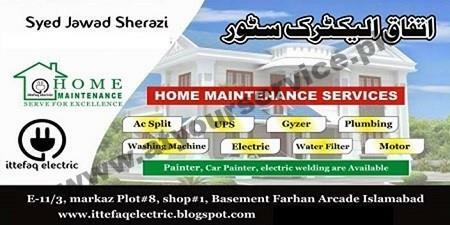 Ittefaq Electric Store is located in Farhan Arcade, E 11/3, Islamabad. It deals in all kind electric hardware and parts. Maintenance service for all kind of home appliances, air conditioner, refrigerator, geyser etc. is also provided. Plumber, electrician, painter and welder are also available on call.